There are many to-do list programs for the Mac. 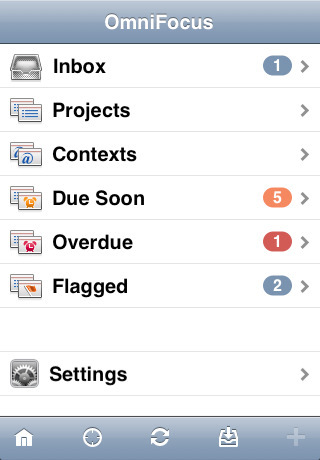 And there are many to-do list programs for the iPhone. But there aren’t many to-do list programs for the Mac that synchronize with the iPhone, an essential feature if you ask me. Actually, there are two Mac to-do list programs that have synchronizing counterparts on the iPhone: Things (Mac link here, iPhone link here), and OmniFocus (Mac version here, iPhone version here). I use OmniFocus, and that’s what I’ll write about here. OmniFocus follows David Allen’s Getting Things Done approach, where every project (no matter how large) is broken into bite-sized pieces (no matter how many). Getting Things Done, or GTD, also emphasizes the notion of “context,” or where something can get done. Some things, like phone calls, can be made just about anytime. Some things, like working on your blog, can only be done from a computer with internet access. Other things, like buying wood for a new planter box, can only be done while out running errands. The idea is that everything that needs to get done has to do with some larger project and has a context where it can be done. You can get a lot done with the Getting Things Done approach, but if it takes you half a day to get organized, you only have half a day left. And, if you can only check your to-do list while in front of your computer, you’re going to forget stuff while you’re out and about. OmniFocus on the Mac, and on the iPhone, solves these problems neatly. 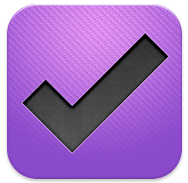 Click here to watch a brief introductory video on the Mac version of OmniFocus. 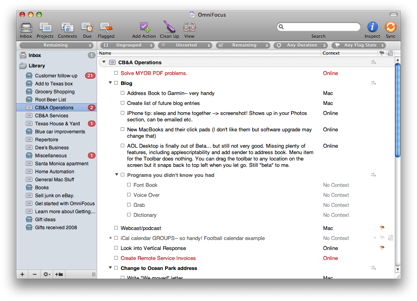 Click here to download a trial version of OmniFocus for your Mac (sorry, there is no trial version for the iPhone). It’s not as complicated as it looks, and you can skip a bunch of features while you learn how to use the program. In the picture above you can see I’m looking at “Remaining” items but I could look at “All” items– in that case there would be several with checked boxes (yes, I’ve actually FINISHED a few things). Touch Projects and it expands to show all of your projects. Touch Contexts and it expands to show your contexts. The Due Soon section shows items that are due “soon” (you can define what “soon” means), and the Overdue section fills itself in with items whose due dates have passed. Flagged items are simply things that you want to be able to jump to in a hurry– maybe they aren’t due anytime soon but you want to be able to refer to them quickly. 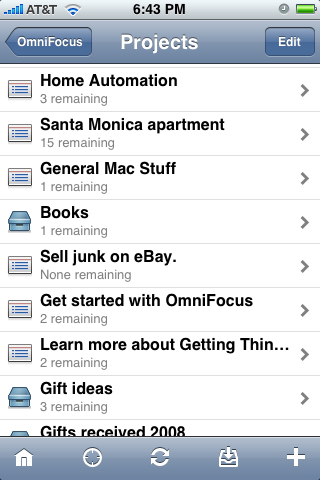 OmniFocus for the iPhone is $19.95, fairly expensive for an iPhone app (and by far my most expensive iPhone purchase). OmniFocus for the Mac is $79.95, also on the pricey side. But man oh man do they ever work well together. Once you set it up they’ll sync through the air, even through the AT&T network, so you’ll always have an up to date list. You can do your main work on your Mac and without your doing anything, the updated list will appear on your iPhone. Make a change on the iPhone and back it goes to your Mac. It’s super groovy. If that’s not enough, you can even sync between two Macs. So, if you work on a desktop Mac sometimes, and on a laptop Mac other times, you can be sure of having the latest to-do list on both, and you don’t have to do anything once you’ve set it up. Recommendation: if you have multiple Macs, and an iPhone, and you have lots of stuff to get done, the combination of OmniFocus on the Mac and OmniFocus on the iPhone will make things a lot easier. It has for me. Just knowing that everything is written down in one place takes a huge load off my mind.